Those winds are getting pretty crazy out there! 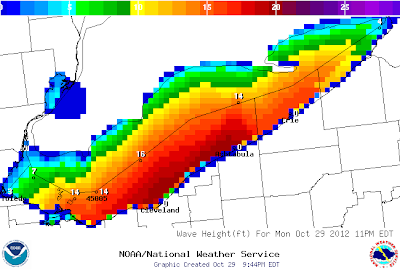 How about Lake Erie though! Winds have been staying pretty strong and kicking up some impressive waves over 20 feet high already. They were predicted 16-22 ft high. The winds have been about 40-50 mph and the gusts have been up to 63 mph earlier. The lake is flat...no buildings or trees...with the flat surface there is no friction for the wind so the winds are able to race across the lake. Additionally, to note, the "eye" of Sandy did come on shore around 6PM tonight. New York is getting pounded with the storm surge. Most of Lower Manhattan has lost power. I am in the weather center for some overnight cut-ins with the strong winds we are seeing. Our winds in Central Ohio will stay strong overnight and the High Wind Warning goes until 6PM Tuesday. The rain has also started mixing with pockets of snow mixing. I did see a few snowflakes outside the station, but by the time I went to grab my phone to take a picture it switched back over to all rain. Wind chills are below freezing so be prepared for a cold morning Tuesday. All of the wintry mix will change back to snow after daybreak tomorrow and remain snow through the rest of the system. Our winds say breezy through Wednesday and Thursday and the rain finally pulls out of here by the end of the week. Our temperatures stay cold, but slowly warming up heading into the weekend with more sunshine returning. Excited about that? Stay warm Tuesday morning and travel safe with the winds and slick roads. Have a good one! Hurricane Sandy mean snow for us? Mobile update: Hospital and celebrating.